The birds are very noisy this morning. Most likely they are glad the tumult of the night is over and are making sure that they have all survived it. I am told that the thunder and lightning was quite serious but know it only by hearsay. I am amazed that I slept through all the clock-stopping noise and electricity! I have to wonder whether I should be relieved to have missed it or embarrassed that I was not awake to what could have been quite dangerous – even a tornado, perhaps. As I muse about the possibility that my spirit may be as inured to danger as my sleeping body, I consider the words of Thomas Merton from “A Search for Solitude,” p.70. * The staccato of the thoughts before the closing statement could be a wake-up call as much as the concluding statement is an examination of consciousness. But the deeper meaning calls to a determination, a choice toward God and to peace. Be content, be content. We are the Body of Christ. We have found Him, He has found us. We are in Him, He is in us. There is nothing further to look for, except for the deepening of this life we already possess. Be content. *Thomas Merton: A Book of Hours – Kathleen Deignan, ed. I found it difficult to go to sleep last night because of the noise, light and torrents of rain in the storm playing outside my window. Perhaps I should have put my attention there instead of on the fact that today would be a long and involved day for which I would need a long and restorative sleep. I should have remembered that lately I usually function quite fine with whatever amount of sleep I have and wake up when God (rather than my alarm) calls…a function of getting older, perhaps. It’s still raining outside but in a gentler, quieter way now. Hopefully the farmers will have received a little of what they have needed for a better harvest and some of the energies in the natural world will have been balanced out a bit for this new day. These thoughts put me in mind of Pierre Teilhard de Chardin – a theologian and scientist whose life and work in the first half of the 20th century have lately found a resurgence in light of the convergence that is happening in science and spirituality. I must admit that his face smiling out from a book cover leaning against a bookcase to my left was also a goad for my reflection. So here’s a thought excerpted from Teilhard’s book, Writing in a Time of War, that might call us to the more today. To live the cosmic life is to live dominated by the consciousness that one is an atom in the body of the mystical and cosmic Christ. The person who so lives dismisses as irrelevant a host of preoccupations that absorb the interest of other people. Such a person’s life is open to larger horizons and such a person’s heart is always more receptive. We’ve had a couple of powerful storms lately – high winds (tree branches down), thunder, lightning and heavy rain. We have not had the destruction that many places in our country have experienced but it certainly is enough to make sleep difficult in the night! These thoughts were occasioned on this peaceful, sunny morning by the reading from Exodus (19:1- 11, 16-20) where God came down to Mount Sinai in fire with the sound of a trumpet and made the mountain tremble with thunder while Moses was speaking to God and all of the Hebrew people watched in awe. The purpose for this powerful display was (as God had already told Moses three days before) so that the people would not only believe in God but in Moses as well. Sometimes we would wish for such clear messages – with audio-visual effects from God, but it doesn’t happen that way. God’s messages are mostly more subtle than that so we have to really look and listen from the inside in order to understand. That’s the message of Jesus this morning about the crowds who don’t understand him when he speaks in parables. 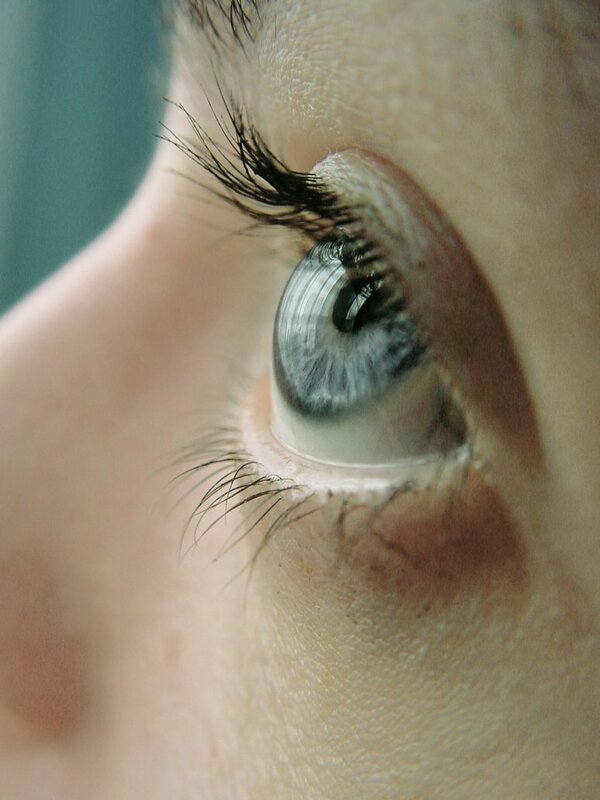 He says that they look but do not see and hear but do not listen or understand. He’s actually complimenting the disciples in the end saying, “But blessed are your eyes, because they see, and your ears, because they hear.” I think of how often I am so wrapped up in my own thoughts that I hear what others are saying but really don’t take it in; I’m not really listening. May we all go today wherever we are called to go with eyes wide open and ears ready to truly listen so that God’s messages might get through to our hearts! Each time I’m sitting by water, whether a quiet lake or a vast ocean, I think of the quote that I saw attached to a picture like the one I snapped in Israel. 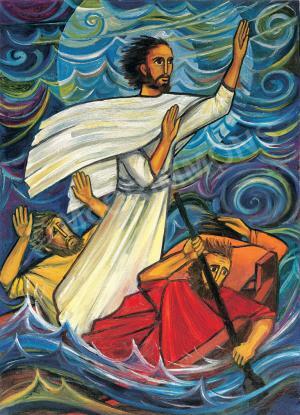 I saved it and learned this morning that it’s from Psalm 107: “He hushed the storm to a gentle breeze…and brought them to their desired haven.” That always reminds me that no matter the “storms” in my life I need only breathe into the conviction that God is with me and will see me through to the end. When I’m sitting in a plane that has just accelerated for take-off it is my practice to breathe a short prayer and then as a sort of “good luck charm” I add a line from my early convent days. One of the elderly Sisters would always add it as we prayed at the start of a trip in the car. St. Frances Xavier Cabrini, although born in Italy, was recognized as the first saint of the United States (not to be confused with Elizabeth Seton, the first American-born saint). At the end of our departure prayer, Sister Jean would pipe up with “Mother Cabrini, take care of us in the machinie.” I have a difficult time now not saying that at the beginning of each flight. It isn’t that I think that will keep the plane from crashing but rather reminds me of Jean and a custom of “real” prayer for safety that is part of my heritage. I would always say I am not afraid to fly. Quite the opposite! I love it! But I would have to admit of a bit of fluttering in my stomach the time we jettisoned most of the remaining fuel because the landing gear was being temperamental (the landing was fine) or on days of high winds when I see the land coming up to meet us on our approach. My faith in God is not shaken at times like these; it’s more my faith in the skill of the pilots and the weather that are at stake. 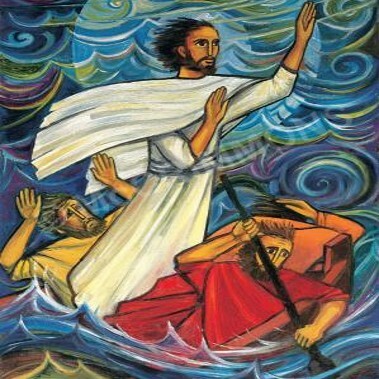 In today’s gospel (MT 8:23-27) the disciples are in the midst of a violent storm at sea and Jesus appears to be sleeping in the boat in spite of it being “swamped by waves.” They cry out to him to save them and when he responds he appears displeased that they lacked faith in him in a dangerous situation. The end of the section gives the clue that their experience of him is still rather new as they say in amazement (after he has calmed the storm): “What sort of man is this, whom even the winds and the sea obey?” I always think of this as rather ironic since they woke him asking him to save them and then are amazed when he does. In some senses I think we are better off since, although we do not have the physical presence of Jesus, the man, with us now in our lives, we do have the consciousness of the power of Christ to keep us safe – in whatever happens. We may even die as a result of a catastrophic event, but we can remain safe nevertheless, because our final goal is the direct presence of God. Thus, having faith transcends what happens to us physically and allows us to rest always in the knowledge that we are never outside of God’s concern and love.